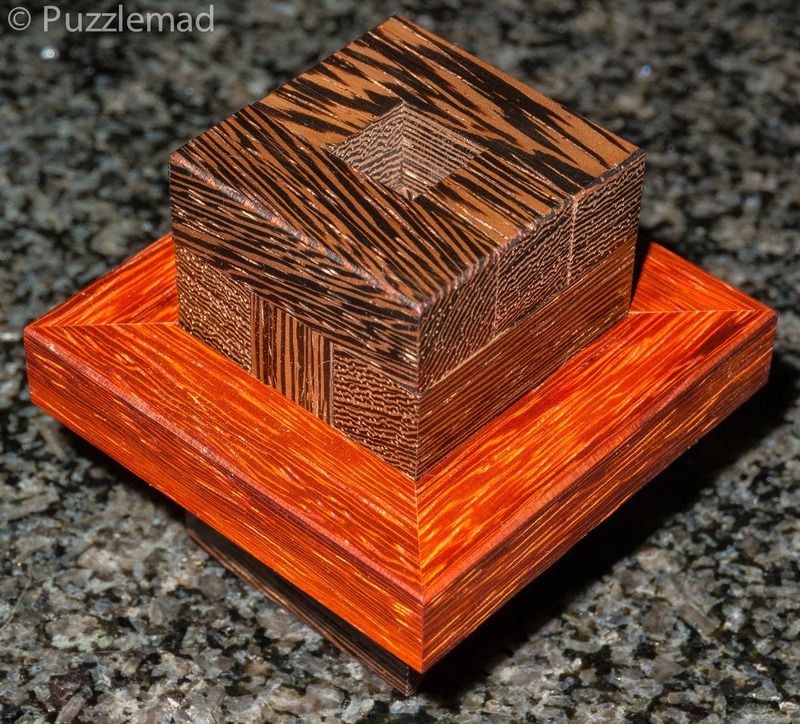 Continuing on the theme from last week, I will focus on another few puzzles I have had some success with recently. It would appear that the last week or so has seen my puzzling mojo return with a vengeance and I have managed to solve some really rather tough puzzles. 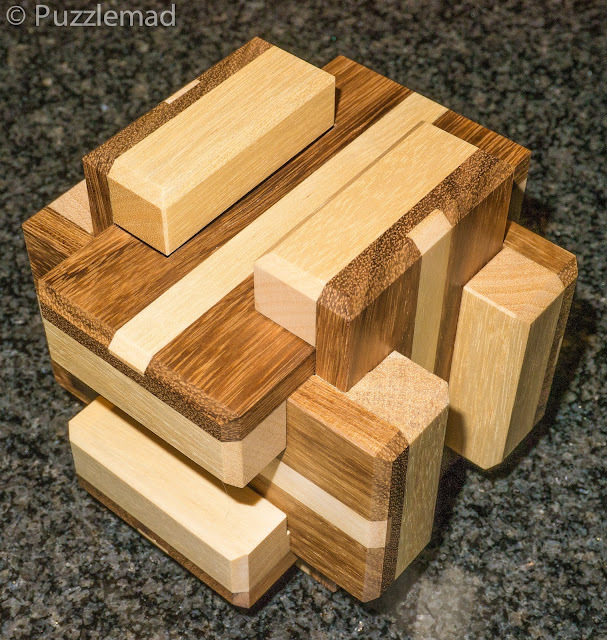 Little Dance was another of the gorgeous puzzles that I bought from Jakub at the New Pelikan Workshop. 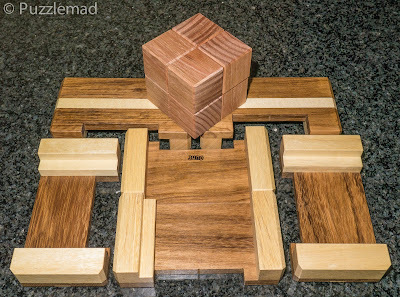 I have quite a few puzzles from Klaas Jan Damstra who seems to specialise in puzzles with very interesting shapes and puzzling moves. He designed the incredible Canal House which I discussed here. 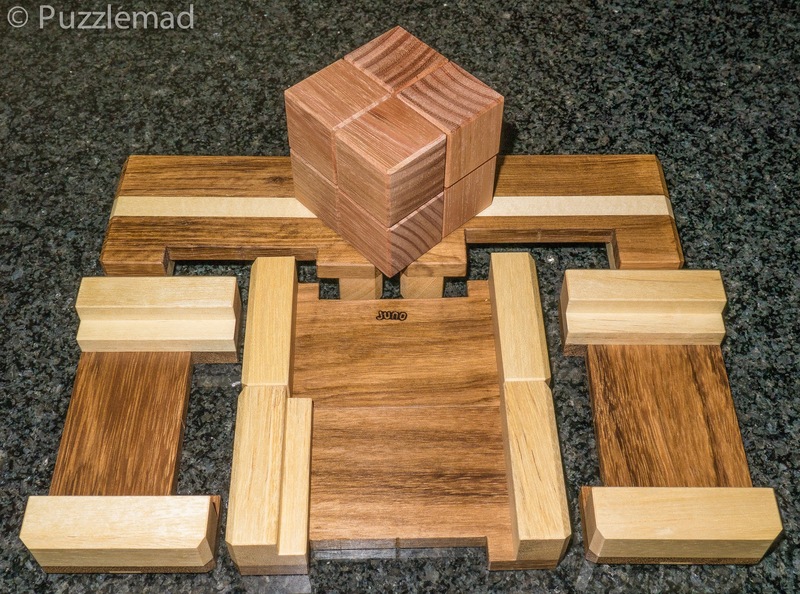 I love puzzles with pieces that dance around each other during the solve process - I find it very elegant. The first thing that struck me when I received this was how beautiful it was and also how absolutely perfect the joinery is. 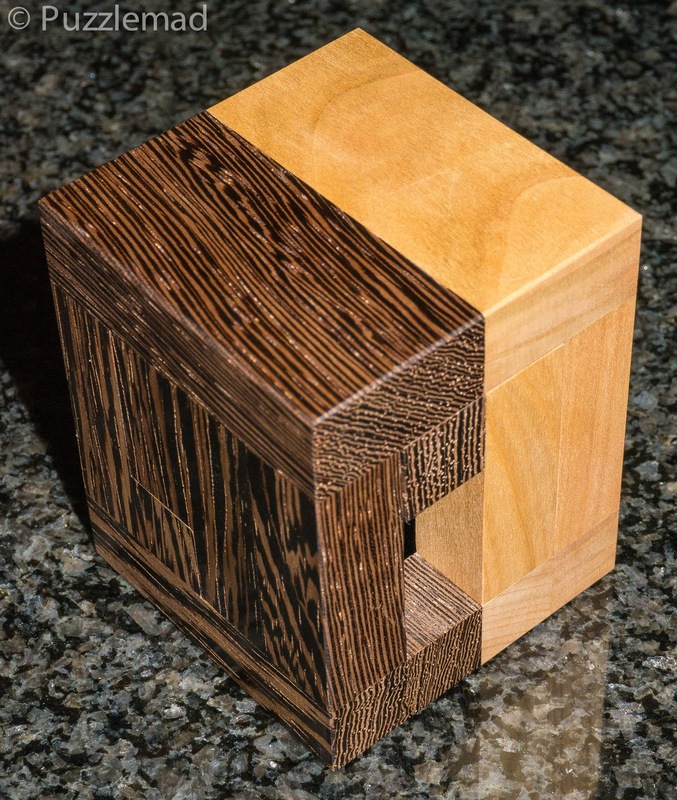 It is almost impossible to see where one piece stops and an adjacent one begins. After photos and a little fiddle I found 2 moves and proceeded from there. There are a couple of blind ends and choices to be made early on. 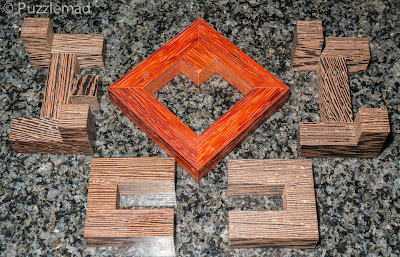 The 2 pairs of pieces are very similar in shape and it is quite easy to get confused and really very difficult to lay down any memories of exactly what has been done. My usual back and forth technique was proving quite tough because, whilst it was quite easy to return to the beginning, I really struggled to work out what I had done each time. The further I got into the solution the worse this got. For a while I got quite stuck....almost all movements apart from the return were blocked. Time to think© and look carefully. I realised that there is a subtle difference between the 2 bigger pieces and this needs to be used in just the right direction. With such a low level of solution I decided to be brave and leave the pieces scrambled for about 20 minutes before attempting the reassembly......BIG mistake!!! I had a vague idea of what I had done and remembered the rough directions of the dance but for the life of me could not remember which piece started where. I had a little panic before pulling myself together and having another go at that thinking© thing - I'm really not very good at it. I found that I was able to plan out some of the moves outside of the frame and then tried them inside it. I got stuck for about 30 minutes before realising that I had started with a simple piece in the wrong place and it was getting in my way later. With that false start in my head, I restarted and BINGO! Phew! No need to resort to Burrtools. I am not very good at assembly but if I have a little knowledge from the disassembly then that is just the little boost that I need. It really is a clever design and wonderfully implemented by Jakub and Jaroslav. The Little dance is still available from the Pelikan store now (only 5 left as I write) so go get it whilst you can. At 29€ it's an absolute bargain! Unfortunately the Deadly Romance puzzle has sold out since last week's blog post. I think this may have been Markus' exchange puzzle at this year's IPP (except he gave it away in pieces as an assembly puzzle). I bought this from Jakub because it was very similar in idea and shape to the wonderful Identical Twins that I reviewed last week. I am actually quite glad that Jakub decided to send it out fully assembled as it was difficult enough for me that I know that I would never have managed to assemble it myself and that Burrtools would not be any help at all. A lovely frame and 2 relatively simple pieces. I am delighted that Jakub sent this one out as an assembled puzzle - there is just no way that I would have managed to assemble it from scratch. In the end my reassembly did take a little bit longer than expected because one of the pieces can be inserted in 2 different orientations and the "law of Sod" of course had me trying the wrong one for about 20 minutes first! Yep! I really am not very bright! I don't know if Jakub plans on making any more of this but it might be worth while asking and if they come up at auction in the future then this is well worth a little punt. 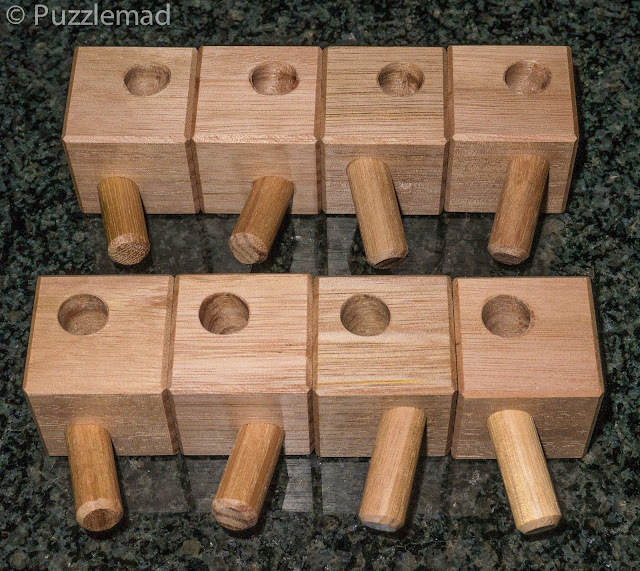 I have been a proud collector of puzzles either designed or made by the awesome Junichi Yananose for quite a few years. 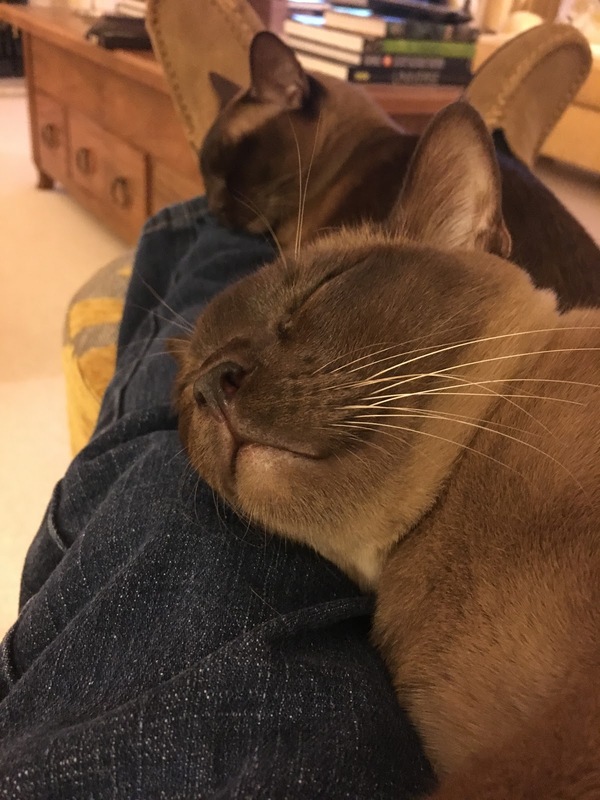 He has worked alongside Brian Young (MrPuzzle) for a very long time. Juno (as he likes to be called) has an incredible brain and seems to be able to visualise things in his head that are too complex for the normal human being to understand (just take a look at the IPP hosts gift from Paris and you will see what I mean). 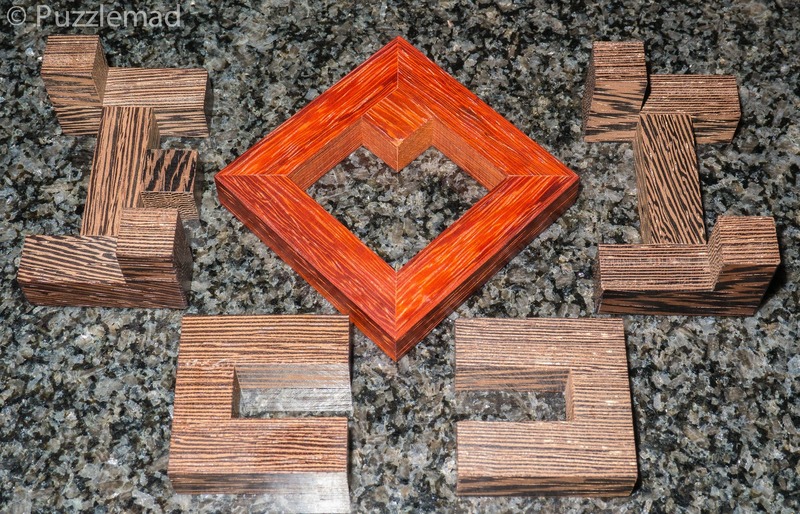 He has recently set up his own blog and shop which I have begun following very closely. I met him (and his wife Yakuri) at their table in the Puzzle party room at the IPP in Paris and watched in awe as Goetz counted out several 100€ for something I really wanted but could not quite afford..........yet - Whack! Ouch! Sorry dear - I mean ever! 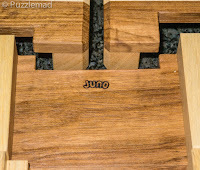 Once Goetz had finished I admired all the wonderful puzzles that Juno had made and designed and in the end couldn't resist buying some. He was incredibly trusting as I had run out of euros by then and was resorting to the PayPal app on my phone but when he couldn't remember his PayPal address, he offered to let me take the puzzles and he would email me an invoice later. Wow! What amazing trust! A month later when I was sure that they had finished their European travels and gotten home to Australia I had still not received the expected bill. I dropped him an email to remind him and he professed to have completely forgotten. 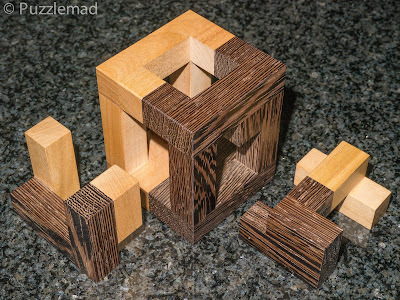 After a little PayPal move (I almost always pay as a gift to craftsmen), I could now feel like a legitimate owner of some wonderful puzzles. One thing to notice within the pieces is the wonderful branded signature. Having read about how it came about on their blog, I was delighted to be able to have a good look at it. Just like the famous leaning tower the pieces of this puzzle have a leaning central dowel which fits into a diagonally oriented hole. As you can see from the above picture there is one of every possible combination. 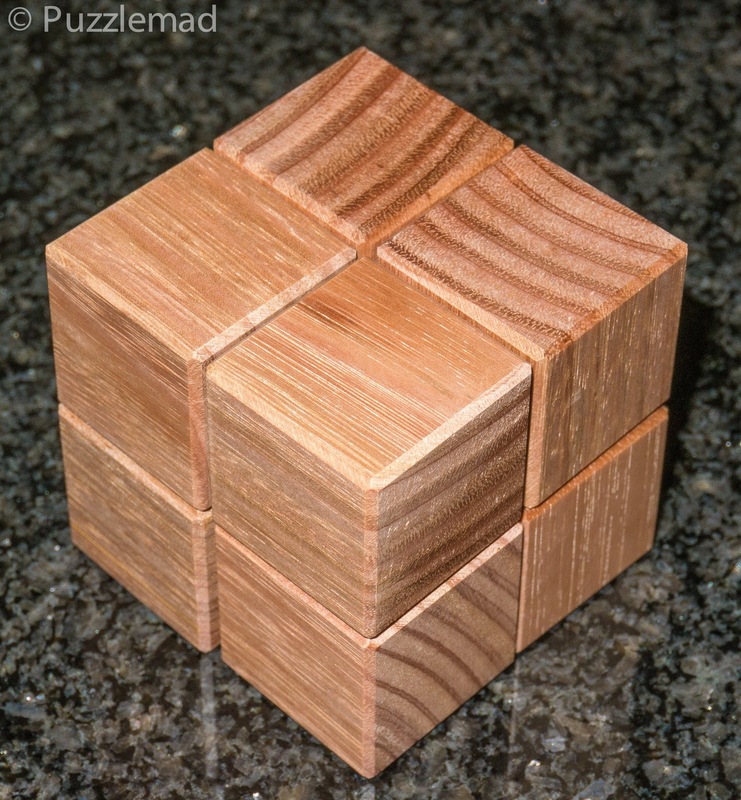 There is just one solution to form the 2x2x2 cube apparently and I had thought it might be relatively easy to perform. Aaargh! Remember that I am not very bright? 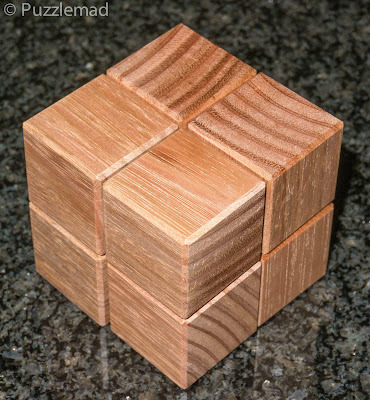 I well and truly revealed that with this puzzle.....I could not for the life of me put it back together! It took me 2 evenings of swearing under my breath and receiving the laser burning stare from the Eye of Sauron before I had reassembled it. You will see from the product page (which I had not read at this stage) that the Pisa #2 should take only about a ½ hour for most puzzlers but I obviously am not "most puzzlers" - I kept finding myself with 7/8 of a cube and unable to place the final piece. It was with enormous relief and another laser stare that I finally got it back together. 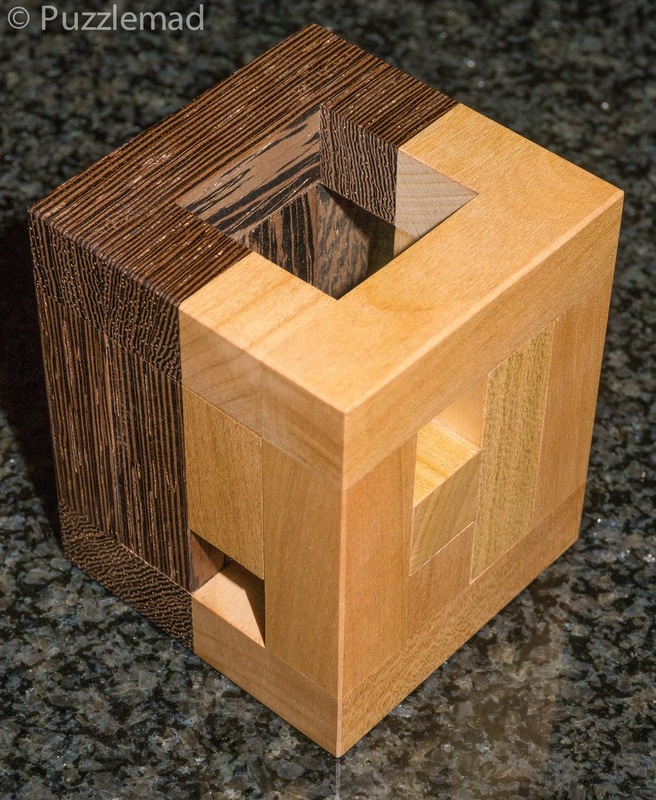 It's just a 2x2x2 cube - how hard can it be? VERY! Finally having done this, I went back to the full reassembly. I have tried it for several weeks without success and eventually resorted to my Burrtools file. I followed it very carefully and nooooo! I still couldn't get it together. The thing is the central cube moves as well as the boards and it is very hard to tell what is happening with it using BT. I also found that I didn't have enough hands to manipulate the computer as well as hold all the puzzle pieces. I thought of asking Mrs S to help and then thought again....better not! 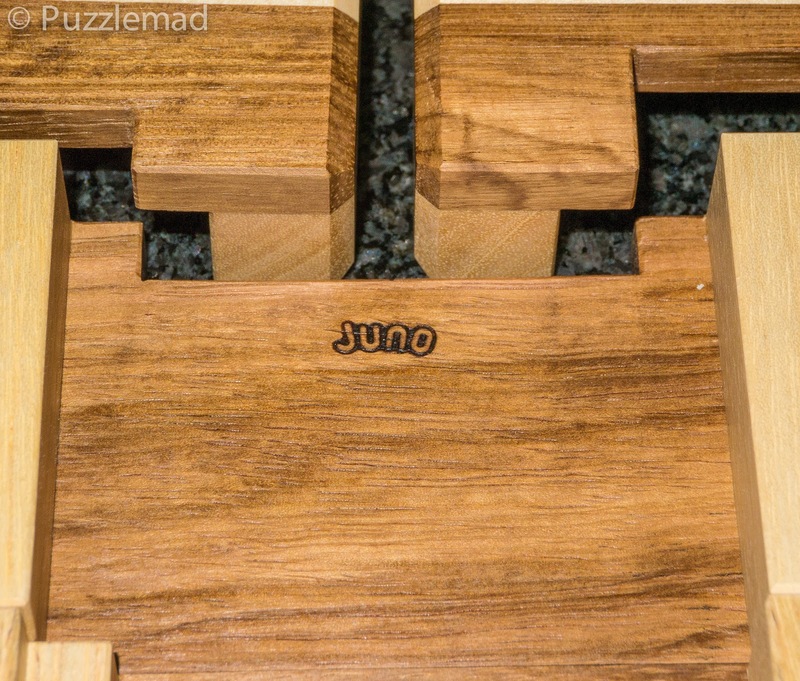 I feared that I would be left with the puzzle in pieces forever more but then I remembered that, like Brian Young, Juno had included a printed solution with the puzzle and so I picked that up and followed it. It requires a bit of dexterity but within 10 minutes it was back together. Now why couldn't I do that with BT? I am determined that I will understand this one so as soon as I have got my courage together I will take it apart again and play. Then I will move on to another one that I bought from them at the IPP. Don't tell Mrs S! 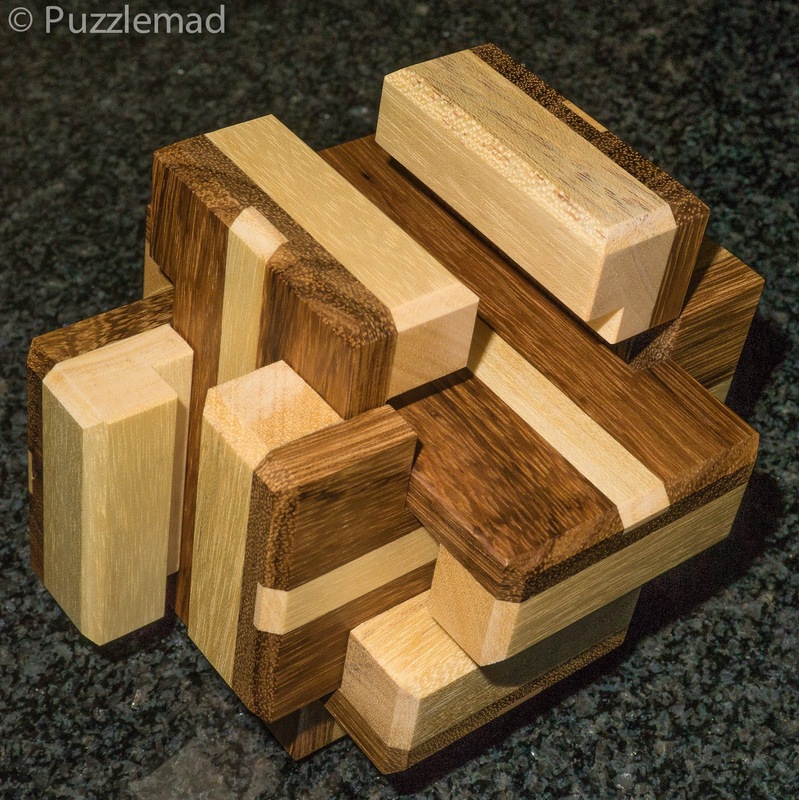 If you are interested in these then do go visit their blog and the Pluredro store - there are some stunning puzzles and the workmanship is terrific. Plus of course, they are a delight to do business with.